For the Salsa Verde you’ll need: 125ml olive oil, 1 clove garlic – finely chopped, pinch chili flakes, 4 strips of anchovy – finely chopped, 1 Tbs capers – rinsed and roughly chopped, grated rind of 1 lemon, 1 tsp Dijon Mustard, 4Tbs finely chopped parsley, 4 Tbs finely chopped fresh herb [sweet basil, oregano, marjoram, thyme], 1 hardboiled egg finely chopped, splash white wine vinegar, sea salt and freshly milled black pepper. Method: In a small frying pan, put half the oil, heat and in it gently fry the garlic for a short while. Add the anchovy, mash with a wooden spoon to break up the anchovy. Remove from the heat and add the capers, lemon rind, Dijon Mustard, herbs, hard-boiled egg, vinegar and season with sea salt and freshly milled black pepper. Set aside. 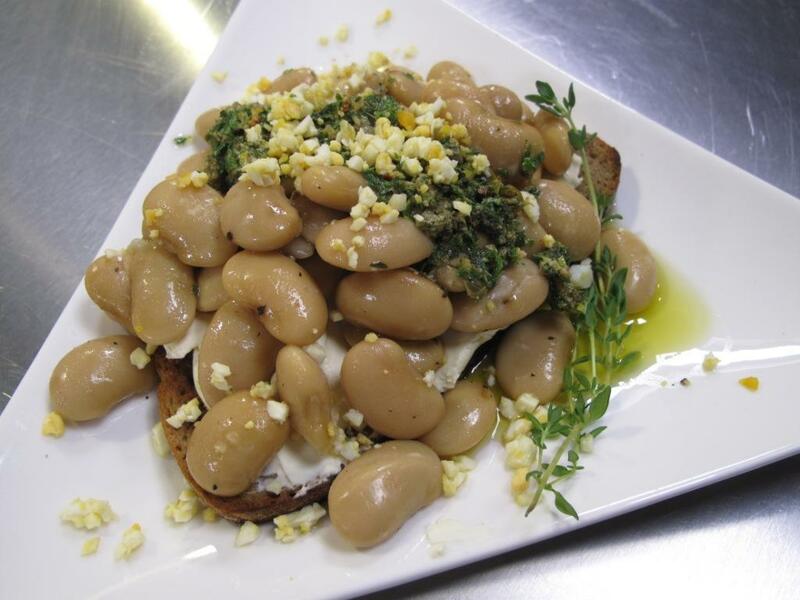 To complete the dish you’ll need: 250g Cream Cheese, 4 big slices round sourdough toasted, 2 x 410g tins Butter Beans – rinsed, drained and seasoned, 1 – 2 cloves of fresh Garlic. Toast the sourdough and rub the hot slices with a clove of garlic. Spread with the cream cheese, top with Butter Beans and a spoon of salsa verde.